Source Naturals, IP-6 Inositol Hexaphosphate is a dietary supplement containing 2,400 mg of IP (inositol hexaphosphate) per portion. The preparation protects cells from the activity of free radicals, enhances immunity, and improves the functioning of the cardiovascular system. IP-6 (inositol hexaphosphate), or phytic acid, is the best known phosphorylated carbohydrate occurring in nature. The substrates for the production of phytic acid are inositol and ATP (as a phosphorus donor). A rich source of IP-6 are mainly the seeds of legumes, cereals and oil plants. According to clinical tests, both in vivo and in vitro, a high content of inositol hexaphosphate in the diet can reduce the risk of developing bowel cancer. Research on the anticancer activity of IP-6 has been conducted since 1988. Moreover, the compound supports the cardiovascular system and exhibits hypocholesterolaemic properties as well as prevents the formation of stones in the kidneys. What properties inositol phosphate exhibits depends mainly on the degree of its phosphorylation. Derivatives with higher phosphorylation levels, including IP-6, exhibit the ability to form insoluble complexes with multivalent cations, for example cobalt, zinc, calcium, manganese, or copper. Thanks to its ability to chelate multivalent elements, IP-6 helps to remove excess metals from the organism. The anticancer properties of IP-6 have significantly increased the interest in the compound, especially in terms of preventing and treating neoplastic diseases. It has been demonstrated that IP-6 can help to inhibit the growth of cells in the case of bowel, prostate, and breast cancers. IP-6 affects such processes as gene expression, the cell cycle, the angiogenesis and metastasis of cancer, and the production of free oxygen radicals. The mechanism of the anticancer activity of IP-6 is very complex, multifaceted, and depends on the type of cells; however, it is most probably connected with its antioxidant properties. The compound binds F3+ ions, which inhibits the synthesis of free radicals. Moreover, it affects the antioxidant potential of F3+ ions and their homeostasis, thanks to which it helps to protect them from participation in the wrong reactions that can lead to, for example, oxidative DNA damage. IP-6 also forms complexes with many cations, which helps to reduce their availability in such cases as cell division and DNA biosynthesis, also when it comes to cancer cells. Another example is the ability of IP-6 to bind zinc ions, which contribute to the weakening of thymidine kinase, an enzyme that participates in DNA synthesis, that way inhibiting the growth of a tumour. IP-6 also reacts with other compounds, for example starch. When combined with phytic acid, starch goes through to the large intestine untransformed, participates in the formation of stool, and that way helps to remove substances that might have carcinogenic properties more efficiently. Additionally, as a result of bacterial fermentation, part of starch can be used to form short-chained fatty acids, which can help to reduce pH in the large intestine and further increase inositol hexaphosphate’s anticancer properties. Some tests have also demonstrated that IP-6 can affect the regulation of immune responses and inflammations, for example by normalising the production of IL-6. 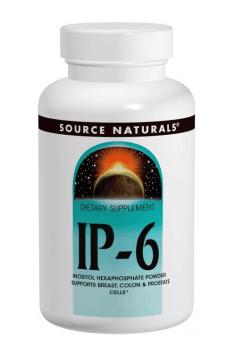 To sum up, Source Naturals, IP-6 Inositol Hexaphosphate is a dietary supplement that can help to prevent cancer by slowing down the production of cancer cells. The preparation can constitute an efficient weapon in the fight against free oxygen radicals and their negative effect on health. Additionally, it supports the immune system, has a hypocholesterolaemic effect and prevents the formation of stones in kidneys. Take 3 tablets daily. For systemic support, take on an empty stomach. For direct colon support, take just prior to or with meals. The right dosage of IP-6 depends on many factors, like age and general health. Normally, the dosage is about 2 g a day in a few portions, so the amount recommended by the producer is definitely appropriate. As IP-6 has the ability to chelate elements, it is a good idea not to take the preparation with meals and mineral and multivitamin supplements in order to prevent their potential deficiencies. Source Naturals is an American vitamin and herbal supplement provider, created in year 1982. The company specialize in producing nutritional formulations for the maintenance of well-being and the enhancement of life – they introduced numerous award-winning formulas, recognized for their excellence in independent surveys and nutritional analyses. The company also provides education that empowers individuals to take responsibility for their health. microcrystalline cellulose, stearic acid, acacia gum, modified cellulose gum, and silica. A dietary supplement containing 5-hydroxytryptophan. Improves mood, facilitates sleep and increases concentration. Ocean fish oil rich in Omega-3. Supports metabolism and improves immunity.